Cyberpunk is a tabletop roleplaying game published by R. Talsorian Games, with the first edition releasing in 1988. The game, as the title might indicate, is based heavily upon the work of William Gibson and Bruce Sterling, to the point where Gibson is often referred to as "Saint Willie" in the various sourcebooks. Set in 2013/2020, the players are mercenaries, criminals, and vagabonds in the cyberpunk street culture of the period. American society has broken down, the government is ineffectual, and anything resembling a good life must be obtained by doing dirty work for one of the numerous corporations that quietly control the world. It's become trendy to heavily modify one's body with any number of cybernetic augmentations, whether it's designer eyes, replacement limbs, or combat-ready military gear, but stacking up too much "cyberware" causes a person to enter "cyber-psychosis" and go full-tilt insane. As the games are a very deliberate, self-aware attempt to capture the feel of the then-burgeoning cyberpunk genre, it can be comfortably assumed that any trope from that particular genre that isn't mentioned will fit neatly here. Supplements to the game allow you to play in specific author's 'verses, such as George Alec Effinger's Marîd Audran. A video game adaptation would be announced by CD Projekt RED, known as Cyberpunk 2077. 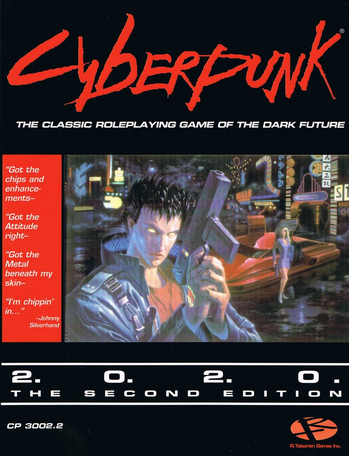 Later on, a fourth edition for the tabletop with a new system was announced as well, called Cyberpunk Red. Armor Is Useless: Averted. Body armor is a necessity to survive even a weak holdout pistol without a lengthy trip to a hospital/medtech. Absurdly Sharp Blade: Monoswords, which, as their name suggests, are Sharpened to a Single Atom. Artificial Limbs: All over the place and often used to replace lost limbs, though cloned (or possibly stolen) limbs may also be used. The prosthetics are also presented somewhat more realistically than usual, with the guide correctly noting that a pair of cyber-arms would not give you Super Strength, as just because your arms are strong, doesn't mean your spine is. Alternate History: Courtesy of a late 80s/early 90s vision of the future. Ax-Crazy: Cyber Psychos are humans that have gone completely batshit crazy and now shoot up anything in sight with their ridiculous hardware. The Psycho Squads dedicated to capturing them are often made up of cops and reformed criminals who are very nearly cyberpsychotic themselves. The Player Characters can become this as well when their Empathy (or EMP) stat drops too low. Such as Purposefully raising your Empathy stat at the expense of Charisma and Agility so you can go from hideous freak with a big heart to a beautiful killing machine. Bio-Augmentation: Biotech, which are enhancements based around biology rather than technology, often using nanomachines, which has the handy benefit of minimizing humanity loss. These can range from antibodies and nanosurgeons that speed up your healing processes to custom organs that replace your original ones, often with bonus features (Want an appendix that lets you process dietary fiber for nutrients? Or how about lungs with improved oxygen capacity?). This is taken Up to Eleven in the Eurosource sourcebooks, as Europeans disapprove of cybernetics, so cyberware is either well hidden or replaced with biotech and also genetic engineering, which isn't readily available outside Europe. Biotech Is Better: Downplayed. The only real upshot of bioware over cyberware is partially side-stepping Cybernetics Eat Your Soul, since having polymers and metal woven through your flesh and bones by nanosurgeons is less mentally taxing than having your arms lopped off and replaced with mechanical substitutes. Though, some of the biotech option are still rather practical (Have a gland implanted that secretes non-toxic antifreeze making you immune to frostbite; get a bunch of nanoids injected that style your hair, brush your teeth, and clear up your acne for you; have the left and right sides of your brain routed together so you become naturally ambidextrous. The list goes on.). Blade Below the Shoulder: In several different varieties, from Molly Millions-style finger razors, to Adam Jensen-esque arm swords, to a knuckle-deploying blade trio subtly named "Wolvers". The City Narrows: "Combat Zones," run-down, crime-ridden districts that exist in every major urban sprawl, where gangs hold sway and the cops only enter in force (if at all). Overlaps with Gateless Ghetto in some cities, where the areas are walled off and the inhabitants are left to their own devices. Cloud Cuckoo Lander: Rache Bartmoss, one of the most brilliant Netrunners of the setting. Also, he's far less harmless than most examples of this trope, if he is to be believed. Corporate Warfare: A war between two of the biggest companies in the world is a major background event. Crapsack World: A cyberpunk hallmark. Life is cheap, corporations run everything, and violence is a fact of everyday life. Cybernetics Eat Your Soul: Each item you install comes with a cost to your humanity. It's not hard to skirt that restriction, and some degree of augmentation is absolutely necessary to compete, but too much of it and you go Ax-Crazy and turn you into a "Cyber Psycho". This is typically guaranteed to end in a showdown with heavily armed, very paranoid cops (several of whom may be on the edge of aug-induced craziness themselves, if they weren't Cyber Psychos themselves before they became cops [Which is also very likely]). The good news, however, is that humanity lost can be regained by shelling out cash for therapy (which is mandatory for Full Conversion Borgs). One of the major selling points or bioware is actively side-stepping this as much as possible. That muscle and bone lace may not make you as strong as cyberlimbs will, nor will that nanooptical reconstruction surgery give you as good of sight as a cybereye, but they are still your limbs and your eyes, which means you'll be less likely to disassociate from humanity and thus less likely to go on a killing spree. The game was the Trope Codifier for this idea. Cyber Punk: Duh. It's even in the title! Cyberspace: Being heavily influenced by William Gibson's writings, this is how computer hacking works in-game. Cyborg: Very easy for people to become one to some extent, and many people are already this. Divided States of America: Alaska, Texas, Utah, Nevada and California (which further divided itself into North and South) have seceded and become free states. Additionally, Wyoming is a Socialist republic that pays token service to the Federal government, and Idaho was briefly taken over by neo-Nazis, who have since been deposed. Drugs Are Bad: Though the option for characters to use drugs is there (wouldn't be cyberpunk if it wasn't), doing so is strongly discouraged (as in the writers directly tell players that it's a very good way to kill their characters). To be fair, the game was released during the height of the Moral Guardians crusade against roleplaying games, when the idea that Dungeons & Dragons led to witchcraft and Satanism was actually taken seriously. Expy: The game's main setting, Night City, is fairly obviously based on San Francisco. The Night City sourcebook even spotlights Expies of other Bay Area cities, such as South San Francisco, Pacifica and Oakland. Foo Fu: "Gun-Fu" to be exact. Future Food Is Artificial: The setting features the Kibble that's described to have the same aspect, smell, and flavor of the dog food from which it takes its name. Gaia's Lament: The world's in pretty rough shape in the near future. A good chunk of the American Midwest is undergoing desertification and the rain is more acidic than not. Gang of Hats: Most of the gangs in Night City have a theme, from the DJs to the Juillard to the Bozos. The Bozos deserve special mention. They're a gang that's had themselves biosculpted into clowns. Those big red noses? Real. Those big floppy shoes? Their feet. The Great Politics Mess-Up: Instead of dissolving like it did in reality, the Soviet Union actually manages to successfully reform itself (though the second edition rewrote the timeline to account for Germany's reunification), but its global influence is greatly diminished.The US suffers economic collapse, several major terrorist attacks, and the secession of a number of states, and ends up becoming a Third World country in all but name. The European Union and Japan are the world's new major superpowers, while China's economic growth was stalled by a nasty civil war between Maoist hardliners and the pseudo-capitalist reformers currently clinging to power by their fingertips. I Meant to Do That: Explicitly mentioned as part of the attitude edgerunners need to have. Japan Takes Over the World: Played with, surprisingly enough. Many of the megacorporations are wholly or partially owned by the Japanese, but the European Union has become the dominant superpower, with euros in use as the new global currency. Kill 'em All: The original Cyberpunk guidebook treats the fact that life in the setting is cheap as a feature. If a character becomes too powerful or angers too many major factions, then the GM is encouraged to simply kill them and let the player start over. Magnetic Weapons: The ESA has a mass driver on the moon which they use to keep the peace. Mechanical Muscles: * There was a limb that was a disturbing blend of flesh and metal. The "full conversion" cyborg the Gemini had the entire body replaced except for the brain. The artwork was a cut-away with the metal parts made to resemble a normal human's muscles. Mega-Corp: Plenty; This IS Cyberpunk after all. One of (if not the) largest has to be Arasaka, who unfortunately is also quite evil. Others Mega-Corp's include Militech, the International Electric Corporation, the Lazarus Group, Petrochem and SovOil. Min-Maxing: A common fan criticism is that the game's "Character Role" class system (which gives certain starting skill sets and unique abilities to characters of a certain class) leads to balance issues, the most frequent being that Solos (aka: mercenaries) are the only viable character types for combat situations (thanks to their special ability which gives bonuses to their spot checks and initiative rolls), and that consequently most Solo builds end up looking very similar (high Reflex attributes & combat skills + low social skills + reflex boosting augmentations). As a result, a number of fan-made rule modifications exist that remove the Character Roles entirely and allow players to build characters from scratch, similar to Cyberpunk's chief rival, Shadowrun. One Stat to Rule Them All: Reflex and Empathy. Reflex so that you can shoot first, faster, and more accurately than anyone else, and Empathy because that increases the amount of cyberware you can implant into yourself before going cyberpsycho. Solos have a profession skill which is added on top of reflexes for combat initiative. Combat rounds usually go "solos first, then everyone else". Organ Theft: There are rules for selling organs to organ banks and there is mention of an organ lottery. Officially, you need a deceased donor card to donate organs and get a reward, but this can be faked rather easily. Shout-Out: There is a book of GM advice titled "Listen Up, You Primitive Screwheads! ", referencing a famous line from Army of Darkness. Squad Nickname: The C-SWAT note Cybernetic Special Weapons & Tactical Squad, PSYCHE-DIV, CYBEnforcement, and MAX-TAC note Maximum Force Tactical Division are all colloquially known as "(Cyber) Psycho Squads" as they are special police squads who capture rogue cyberpsychos and who are just barely cyberpsychotic themselves, some of whom are rehabilitated cyberpsychos. The Sociopath: Low Empathy characters are assumed to be this or something similar. Super Reflexes: Combat in the setting is set up to be won by whoever gets to go first in a turn, due to its overwhelming lethality. As such, a number of augmentations exist to improve a character's initiative roll and you would have to be crazy not to take them. Talking Is a Free Action: Starting combat by delivering your characters Catch-Phrase or a (potential) Pre-Mortem One-Liner under the Friday Night Firefight rules doesnt end your round. Upgrade Artifact: Skillsofts, chips with software that conveys skill in certain areas as long as they're plugged in. There's a hard cap on how much the skillsoft can help you, and they don't stack with normally acquired skills, so you'll never be as good as people who train the old fashioned way.